The Southeast Missouri State University baseball team has started its 2014 regular season with a record of 6-2 under second-year coach Steve Bieser. The Redhawks won their first game of the season, which was the beginning of the three game series in Tulsa, Okla., against the Oral Roberts Golden Eagles. "We're real pleased with our start," Bieser said. "We went into a very tough venue at Tulsa, Okla., against Oral Roberts. They have a strong tradition of being a very good ball club and we were able to take two out of three. The team felt like they were going to get off to a really good start, and they went out and played very well over the weekend." Bieser's first year as the head coach ended with the Redhawks going 26-33 overall and 13-17 in Ohio Valley Conference play. Bieser said that his expectations for the team are to just continue to get better with every game that it plays. "I think the third game there [against Oral Roberts], we really got shut down offensively and we need to continue to make adjustments throughout the course of the season to get better each game," Bieser said. "We expect to play a really solid game day in and day out and hopefully as the season goes we can progress and get better." Southeast finished sixth in the OVC standings last year and was also picked to finish sixth again this season by OVC head baseball coaches and sports information directors. "I think every team has one goal and that's to win a conference championship," senior outfielder Derek Gibson said. "Day in and day out I just need to go out and give it everything I've got just like everybody else on the team. I think that we all approach every day in the exact same manner." The starting pitchers for the Redhawks are Andrew Croucher, Christian Hull, Tyler Iago, Ryan Lenaburg and Alex Winkelman. Iago has pitched 12 innings for the Redhawks and holds an ERA of 1.50 as he has also recorded 13 strikeouts. He is 2-0 this season as a starting pitcher and recently shutout the Indiana University-Purdue University Fort Wayne Mastodons in an 18-0 series opening win where he added nine out of his 13 strikeouts on the season. 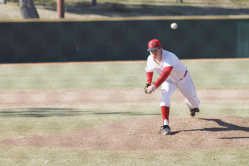 The Redhawks won the series that was held in Cape as the beat the Mastodons in all three games that were played. Junior second baseman Jason Blum, junior right fielder Dalton Hewitt, junior third baseman Andy Lennington and senior first baseman Matt Tellor have been leading the team at bat for Southeast as they have accounted for 10 or more hits thus far. "One of the biggest challenges is getting our guys to gel," Bieser said. "We've got a lot of new faces. The good thing about spring sports is that they've been together for almost an entire school year before they actually started the season. Once you start the regular season then you're on the field and our guys are in a different fight. As we continue to trust one another I think [everyone] will see that we will start playing better baseball and that's something that every team goes through is you just want to see that continual progression of improving each and every day." Tellor has been at bat 31 times this season and has come away with a .355 batting average, 11 hits, one home run and 7 RBIs. He is the returning starter at first base as he recorded a team-high eight home runs last season, a team-high 46 RBIs and tied with Blum for the team-high hits with 73 last season. Hewitt also had a position clinching season last year as he led the Redhawks in batting average at .345 by the end of the 2013 season in his sophomore campaign. Accompanying Hewitt in the outfield is Gibson, who has started 98 games for the Redhawks the past two seasons and was named as a first team All-OVC outfielder his sophomore season. The 25 times that Gibson has been at bat this year, he has scored four runs for the Redhawks and holds a .280 batting average with seven hits. During Gibson's all-conference sophomore year, he hit for .338 with seven home runs and 38 RBIs. He was also named National Collegiate Baseball Writers Association National Hitter of the Week and CollegeBaseballInsider.com National Player of the Week on May 2, 2012. Being a senior this year, Gibson's role as a leader on and off the field has enhanced. "I definitely think that [leadership] comes with age, but you don't have to be a senior to take part in leadership," Gibson said. "I think we've got a lot of pure guys on this team. I try to do my part and set good examples on and off the field and we're a very balanced team."